When people contemplate the need for additional space they often think of building out a new room, taking down a wall and combining two rooms, shoving everything into the attic or basement or even renting a cinder block box with a noisy overhead door somewhere on the outskirts of town. One possible solution to their spatial dilemma that doesn’t necessarily come to mind is finding space on the walls. But the truth is there are uncharted volumes of un-utilized space on virtually every wall in your home or office that’s just waiting for something to do. The kitchen cabinet is probably the best example of that notion put into practice. Now take the concept of kitchen cabinets and apply it to the other rooms in your home, call the new storage spaces “wall units Toronto” and suddenly the storage possibilities become nearly endless. They can be as grand or simple in appearance as you want and made of anything from plastic to hardwood. They can be wall mounted or built in, have doors or not and are not beholden to any one particular design aesthetic. Beyond issues of simple appearance storage units that project from your walls can be used to denote divisions of space if you have a large, loft style open plan dwelling or office. They can also be clipped onto tracks on the wall and moved around to your heart’s content, like track lighting. At Superior Closets we offer wall units in a dizzying array of styles and finishes to serve any function you can imagine. Whatever your needs and whatever your budget we can create a custom designed storage system for you that makes optimum use of available space while complementing your existing design aesthetic and enhancing the overall look and feel of your home or office. 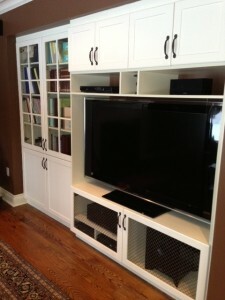 We constantly strive to attain the perfect balance of function and form in the wall units we design and install. We never approach a project with preconceived notions about what will work but instead make a thoughtful determination based on close consultation with you and a thorough examination of your space. In the end this allows us to create storage solutions for you that will fulfill your needs for additional capacity while adding to the beauty and function of your home. There are many closet companies...but only one is SUPERIOR! We provide Free Estimates, Lifetime Warranties, and a Lowest Price Guarantee!